Okinawa-kenpo is a karate style which has been developed based on ancient Okinawan martial arts called "Ti". Its technique and thought were studied and refined by a Tomari-te master, Shinkichi Kuniyoshi (also known as "BUSHI" Kuniyoshi) and passed down to Grand Master Shigeru Nakamura, the founder of Okinawa-kenpo. Grand Master Nakamura opened his own dojo "Okinawa-kenpo Karate-do Shurenjo" at Agarie, Nago city and taught his art of karate. Grand Master Nakamura disliked the thought of karate being divided into separate styles. There used to be no Ryuha (schools) in Okinawa karate. All styles were merely called "Ti". That was the reason why he simply named his karate "Okinawa-kenpo", which means "Okinawa Ti". His intension was to unify all styles of karate under the name of Okinawa-kenpo. He called for like-minded karate-ka (karate practitioners) and held meetings to try to make his dream come true. 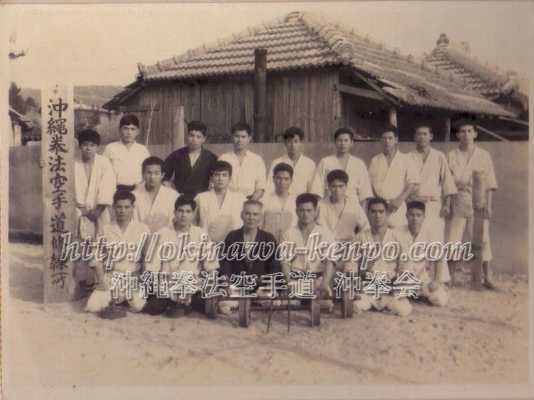 In June 17, 1961, karate masters from all over Okinawa gathered at Yashio-so, Naha city. At this meeting, they had a discussion about the unification of Okinawa karate and finally came to endorse it (Establishing of Okinawa Kobudo Kyokai). However, after Grand Master Nakamura's passing in 1969, the group fell apart. Today, Okinawa-kenpo is known as a name of karate style. We use the term of "Okinawa-kenpo" not only for indicating our style, but also for inheriting Kuniyoshi and Nakamura's will. Our goal is to preserve BUSHI Kuniyoshi's Tomari-te and pass it to the next generation. "Until the formation of Okinawa-kenpo"
"Okinawa-kenpo" was founded by Grand Master Shigeru Nakamura in 1960 as an association of diverse dojos based on his belief "there is no Ryuha in Okinawa karate". Participation to a competition in Kyushu as "The All Japan karate-do Federation, Okinawa District" was how it all started. Nakamura felt how strong Japanese karate organization was at the competition and worried about the future of Okinawa karate. 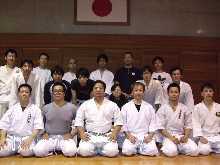 Then, he appealed to all karate-ka in Okinawa for participating to the movement of "Okinawa-kenpo". 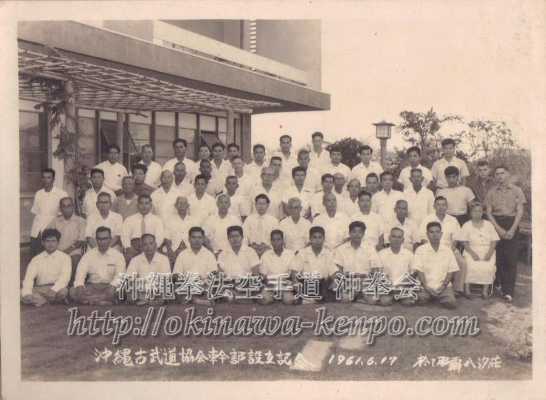 In June 17, 1961, karate masters from all over Okinawa gathered at Yashio-so, Naha city. At this meeting, they had a discussion about the unification of Okinawa karate and finally came to endorse it (Establishing of Okinawa Kobudo Kyokai). After Nakamura's passing, the group fell apart. However, Okinawa karate advanced to an era of great development. Each karate style goes on its own way, and Okinawa-kenpo has become the name of the style which was taught and practiced by the students of Grand Master Nakamura. 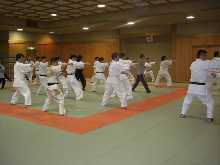 Various Ryuha participated in the movement of "Okinawa-kenpo". Mostly, they were from "The All Japan karate-do Federation, Okinawa District" and "Okinawa Kobudo Kyokai". Exchange of techniques was widely performed among them. 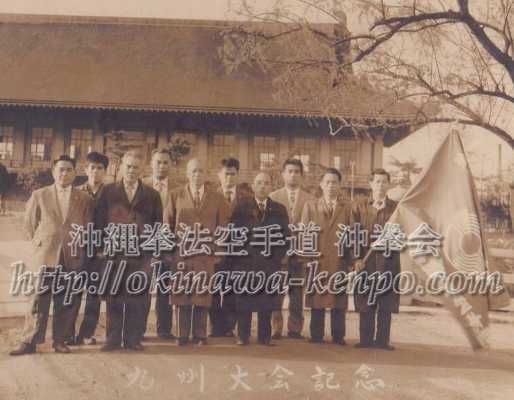 "After the passing of Grand Master Shigeru Nakamura"
After the death of Nakamura, Okinawa-kenpo was divided into several groups. 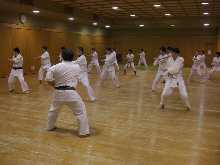 Each group inherited Nakamura's will and techniques and developed Okinawa-kenpo in their own way. Old style karate techniques and training methods still remain in our system. We train with those methods, which are rarely seen in other Ryuha these days. 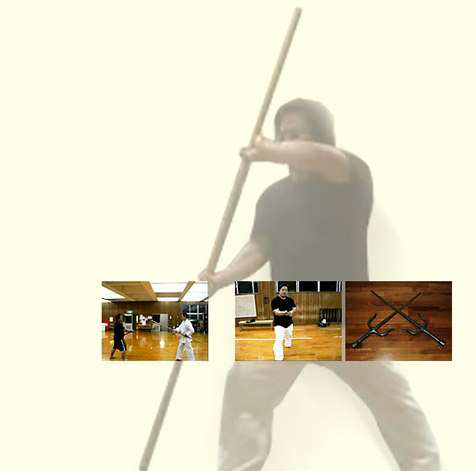 "Four kinds of "back training"
Our techniques, from empty hands to weapons,are incorporated in a coherent system and consist of common basic skills. Historically, Okinawa-kenpo inherited various Kata. however it does not mean that we deny their existence or insistence. Born in Wakuta village (now a part of Naha city). He was a famous master of traditional Okinawa "Ti", which consists of empty hands and weapon techniques. Born in Kumoji village (now a part of Naha city) and moved to Tomari village later. He was a student of "BUSHI" Sakiyama (Kitoku Sakiyama). He was renowned for his powerful fist, and his punch was strong enough to sink into the ground to his wrist when he hit it. He had continued to study traditional Tomari-te and was known as "Tomari Bushi Kuniyoshi". He moved to "Yanbaru"(northern part of Okinawa island) from Tomari village in his late years and taught "Ti" to Nakamura and others. 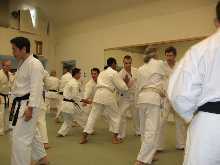 He taught following Tomari-te Kata and technique; Naihanchi, Seisan, Niseishi, Passai, Kusanku, Buki (Weapons), Buki-no-kumigata, and etc. Born in Nago village (now Nago city), he inherited Tomari-te from Shinkichi Kuniyoshi. In 1906, he learned karate from Anko Itosu, Kentsu Yabu, and Chomo Hanashiro at Okinawa Prefectural Icchu Middle school (now Okinawa Prefectural Shuri High school). After returning to his home town of Nago, he challenged to Bushi Kuniyoshi, who moved from Tomari village, and was knocked out with one punch. Nakamura admired Kuniyoshi's strength and became his disciple. Other than Kuniyoshi, he widely exchanged his skills and knowledge of karate with famous masters such as Kanryo Higaonna, Soko Kishimoto, Choki Motobu, Chotoku Kyan, Chojun Miyagi, and etc. After WW2, Nakamura opened his own dojo at Miyazato, Nago village. On Feb. 5, 1960, he was awarded his Hanshi 10th Dan certificate from The All Japan karate-do Federation. He formed "The Okinawa-kenpo Karate-do Renmei" in the same year. In 1967, he was honored with lifetime achievement award of sports karate from The Zen Okinawa Karate & kobudo Renmei. He proposed "full contact free sparring with Bogu gear" and made an effort for its spread around 1950 (1940?). Based on his belief "There used to be no Ryuha in Okinawa karate", he tried to unify all the styles of Okinawa karate under the name of "Okinawa-kenpo". Born in Haneji village (now a part of Nago city), he started learning karate from Grand Master Shigeru Nakamura at the age of 19. He inherited complete Nakamura's karate system. 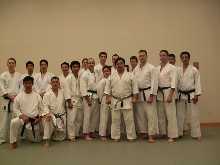 He taught karate to other students as Shihan-dai (instructor) at Nakamura's dojo, Okinawa-kenpo Karate-do Shurenjo. In 1969, he received Shihan certificate and was appointed as Nakamura's successor by The Okinawa-kenpo Karate-do Renmei. After Nakamura's passing, he retired from Okinawa-kenpo Karate-do Shurenjo and started teaching karate at his house of Haneji, because he thought "Sensei's son should be the successor". The council meetings of The Okinawa-kenpo Karate-do Renmei were held at Haneji thereafter. His students were Tatsuo Yamashiro and others. Born in Nakijin village, Kunigami County, Okinawa. He became a disciple of Hiroshi Miyazato by the advice of his father, who was a friend of Kentsu Yabu. After mastering the art of "Ti", he moved to Naha. By the introduction of Sensei Miyazato, he started training full contact free sparring with Bogu gear under President Toshimitsu Kina. As vice president of The Okinawa-kenpo Karate-do Kyokai, he made an effort for the spread and development of Okinawa-kenpo while cooperating with President Toshimitsu Kina. He had sponsored "All Okinawa Full Contact Fighting with Bogu Gear Tournament" since 1990. He became independent from The Okinawa-kenpo Karate-do Kyokai in 1995, and started as "Okinawa-kenpo Karate-do Oki-Ken-Kai". 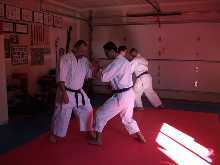 We, Okinawa-kenpo Karate-do Oki-Ken-Kai, work on in a unit called "Keiko-kai". is a group of like-minded people to practice Okinawa-kenpo any time and anywhere. "Hokkaido - Touhoku region", "Kanto region", "Tokai - Hokuriku region" "Kansai region", "Shikoku region", "Chugoku region", "Kyushu region" and "Okinawa". 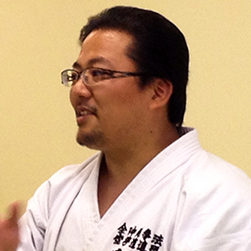 Shihan Yamashiro visits each Keiko-kai regularly, trains them, and conducts open seminars. 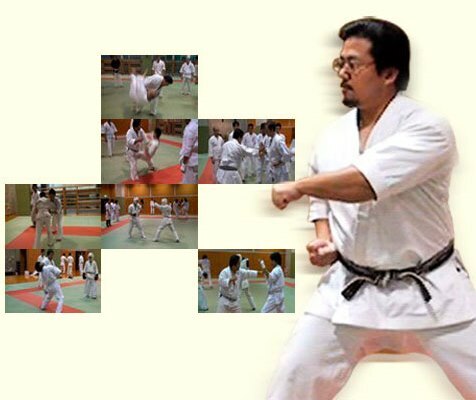 Shihan Yamashiro has been invited by masters of other styles, and conducted seminars regularly. He started practicing karate when he was little with his father, Tatsuo Yamashiro, who inherited "Ti" from Hiroshi Miyazato. and was the runner-up in 1990 (His older brother won 1st place). He participated in "World Karate and Kobudo Exchange Festival of the 1st Worldwide Uchinanchu Festival" in 1990. He established "Okinawa-kenpo Kobudo Club" at University of the Ryukyus, and became the 1st president of the club. He learned Okinawa-kenpo from Sensei Hiroshi Miyazato directly and inherited ancient Okinawa "Ti". Today, he conducts the training groups and seminars at Okinawa, Kanto region, Kansai region, USA, Canada, Australia, and etc. He has made much effort for the spread and development of Okinawa-kenpo. © 2010 - 2019 Okinawa-Kenpo Karete-Do Oki-Ken-Kai All Rights Reserved.